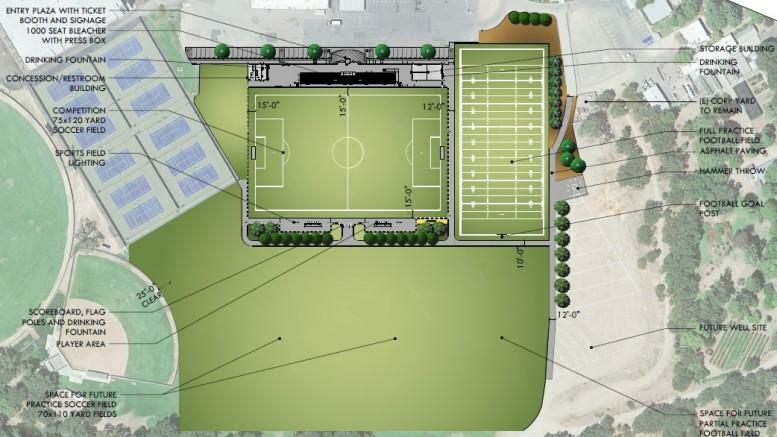 The contract to build the proposed athletic facilities shown in this rendering is currently being bid on by general contractors. Dean of Athletics Greg Warzecka hopes that construction will start in "early summer." Update Aug. 24, 2015, 4:23 p.m.: The athletics department has since stated that construction of the new complex will begin during the fall 2015 semester. The American River College athletics department will begin construction on a new complex in the “early summer,” according to Dean of Athletics Greg Warzecka. The PE and Athletic Field Renovation Project is currently being prepared to be bid on by general contractors. The largest part of the project scheduled to be built is a 1,000-seat soccer stadium equipped with lights, a scoreboard and concession stands. In addition to the stadium, the project includes new practice fields for the football team and soccer team, as well as a hammer cage for the track and field teams. According to Warzecka, ARC is attempting to match the quality of the facilities at Cosumnes River College and Folsom Lake College, in what he said will be a “significant improvement,” over ARC’s current facilities. Women’s soccer head coach Paul Arellanes agreed with Warzecka’s assessment, and said the fields now need more work than ever before. “If this facility gets built the way we want to, there won’t be one like it Northern California and possibly the state,” said Arellanes. Men’s soccer head coach Paul Hansen said he believes the new fields will create a much nicer environment for the fans. Be the first to comment on "New athletic complex scheduled to break ground this summer"